I'm delighted to review another set of Marty Schwartz's Beginner Acoustic Easy Songs DVD's on my blog! There are a total of 9 DVD's as part of this series and I previously covered a review of discs 1, 2, and 3 in an earlier post. If you have ever checked out YouTube for free guitar lessons, you've probably come across one of Marty's videos. With over 200+ millions views, he continues to be one of the finest teachers I have ever come across on the web! 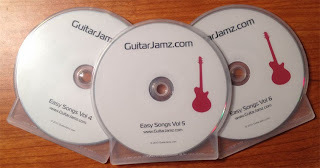 The Beginner Acoustic Easy Guitar Songs Volume 4, 5 and 6 DVD's is well suited for beginners who are familiar with playing basic major, minor and 7th chords. Marty has a mix of terrific sounding progressions (chords that work well with one another) and also gives you a variety of different strumming patterns to practice along with these chords. Most of his examples use standard tuning on the guitar (EADGBE), but he mixes things up a little with Drop D tuning (DADGBE) and also flatting each of the notes (Eb Ab Db Gb Bb Eb) on the guitar with some of the lessons. I often play using standard tuning, so it was fun for me to try using some different tunings! If you have been stuck playing basic chords for a while now and looking to spice up your playing, then I think you'll find lots of fun tips and tricks in these DVD's. For example, Marty picks out the bass note of a major chord and "walks down" to the bass note of a minor chord This is a fun technique and the extra movement can make an ordinary chord transition sound much more refined. Although songs are not specifically named, I heard some chord progressions that sounded like Hotel California, La Bamba and other well-known famous songs. For me, it all ties back to songs, and so much fun to see how the chords I already know are used in so many great songs! In addition to the above techniques, Marty uses examples with a guitar capo which is helpful for beginners. There are some great demonstrations of using harmonics, power chords and open chords, which all have unique sounds, especially on an acoustic guitar. Marty also includes lots of embellishments for use with the basic open position chords. These small movements such as hammer-on's, pull-off's, or adding extra notes to a chord are extremely useful to have in your guitar toolkit, given that so many songs use these standard chords. Unfortunately, as with my last review, I did have some difficulty loading up one of the DVD's from my set. However, after multiple attempts, I was finally able to get it to play. It could be my DVD player or the quality of the discs (I suspect it was from the disc), but it was bit frustrating that it did not play right away. In any event, the content of the DVD's were terrific and I really enjoyed going through and practicing this material! Even if you are not a beginner, I think there are some great nuggets of guitar "gold" packed into these lessons and hours worth of songs and strumming exercises await on the Acoustic Easy Guitar Songs 4, 5 and 6 DVD's. As always, Marty continues to use his humor and unique teaching style to make it fun to learn the guitar! Are you ready to rock out to some easy beginner songs with Marty? Click here to order Marty's Beginner Acoustic Easy Guitar Songs 4, 5 and 6 DVD package! Has Marty Schwartz helped you to become a better guitarist? Have you purchased this DVD package? It would be awesome if you can share your feedback below! Marty offers these programs as either Value Bundle sets or as individual DVD's and CD's. * Note: All of Marty's DVD's come with a full 12 Month No Questions asked return policy. Lifetime membership to GuitarJamz.com (which currently has over 1,500 online video lessons)! Every DVD that Marty has produced from GuitarJamz will be sent to you by mail! All future DVD's from GuitarJamz will automatically be mailed to you! Check out Marty's Guitar Video Lessons for 3 Full Days on GuitarJamz.com! Click on the yellow "Order Now" button, no credit card is needed to take a free test drive. You'll receive premium access to over 1,500 videos from GuitarJamz for 3 days! The Value DVD bundle and CD sets seen above are typically discounted and many include extra bonuses. However, I have rarely come across any special GuitarJamz coupon or promo codes, with the exception of free access for 3 days to the premium video lessons on Marty's Members Only site (see above). If you are aware of any extra discounts, please feel free to leave a comment below. Disclosure: Please note that I use an affiliate link to GuitarJamz.com and I will earn a commission if you purchase Marty's material through my link (at no extra cost to you). My advice is to start with his free YouTube video lessons (there are hours and hours of free content here!). If you do decide to purchase Marty's material I would really appreciate it if you can click through this affiliate link. Free 1-Hour Strumming Course from Marty Schwartz and GuitarJamz! No sign-up required and receive immediate access! Take a minute to tune up guitar. It will sound so much better! Per FTC guidelines, this website may be compensated by companies mentioned through advertising, affiliate programs or otherwise. FREE Guitar Tips to Help You Improve!